It’s increasingly important to maintain some semblance of control over our digital persona’s. The web is fast becoming the first place people look to find information about one another. There are approximately 80 million names queried on Google every single day, and most prospective employers will look someone up on the web before making a hiring decision. It’s become increasingly important that you have more positive content in your results. A new application called BrandYourself is stepping up to help you take control of your Web-facing self. We started BrandYourself because our co-founder Pete was being mistaken for a drug dealer in Google and couldn’t get an internship in college. We realized Google is an incredibly important part of your reputation, and most people wished they had better results. The problem was, if you didn’t know how to do it yourself you were either helpless, or forced to pay thousands of dollars for expensive reputation firms to do it for you. This is just not realistic for the average person. Go ahead… I’ll wait… I know you want to go Google yourself to find out if a drug dealer (or anything else) pops up to see how much you need Brandyourself. This is done by building a Search Engine Optimized (SEO) BrandYourself page that’s geared to show up high in a Google query for your name. You tie other important information to your BrandYourself profile and your BrandYourself profile to your information. So you can tie your LinkedIn, Twitter, Facebook, Google+, personal websites, articles written about you, etc. 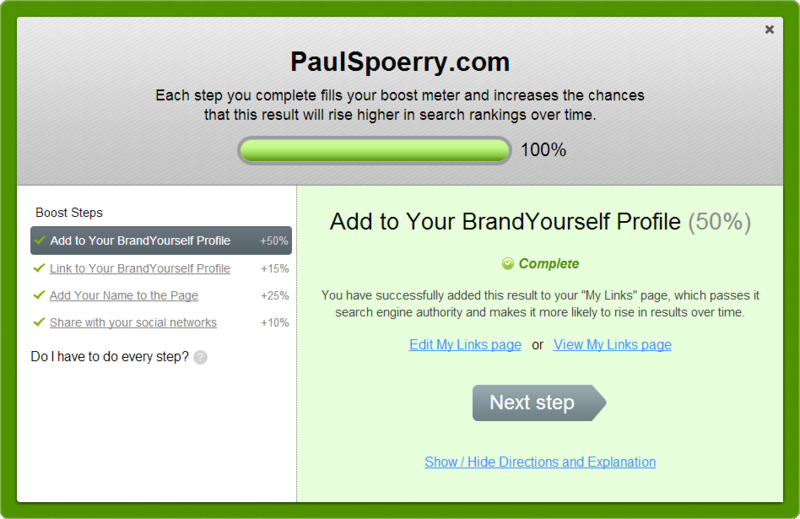 BrandYourself will then track it’s search ranking, analyze it and help you “search engine optimize” it so they show up higher for your name. 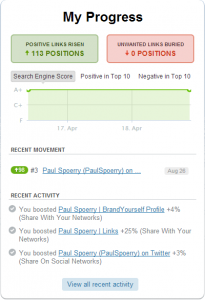 Raising positive links will bury unwanted results off the first page and deep down in results. Since 93% of people never leave your first page, Your Search Score monitors your first page and alerts you every-time your score changes or something new appears. So BrandYourself helps you track your progress, get alerts when a positive links moves up or down in the search rankings, and can even help see who’s viewing you online. If you imagine something like a reputation management mashup of About.me, LinkedIn, and Klout then your not to far off on how BrandYourself works. You simple start by submitting any content that already exists — your LinkedIn profile, your personal website… really anything that helps identify you or your personal brand.Then the BrandYourself software analyzes each link you submit and gives you specific steps you can take to make them easier for search engines to find and rank for your name. When it’s done it offers step-by-step instructions on how to “boost” that content in the search engine rankings to better help BrandYourself. Apply custom domains to your profile. 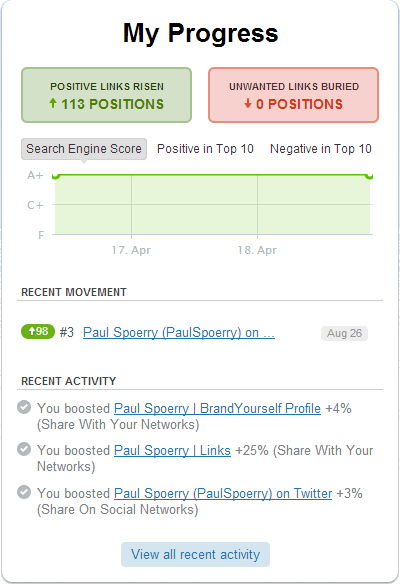 I own “PaulSpoerry.com” so that already has strong branding associated but if you don’t have a vanity URL you can apply custom branding with one. If you’re interested in maintaining control over your online identify you should give BrandYourself a try. You might also want to check out my article on TrustCloud, a service that aims to create an online/offline “FICO Score Style” brand of trust.